Ryoan-ji (The Temple of the Dragon at Peace) is a Zen temple located in northwest Kyoto, Japan. It belongs to the Myoshin-ji school of the Rinzai branch of Zen Buddhism. 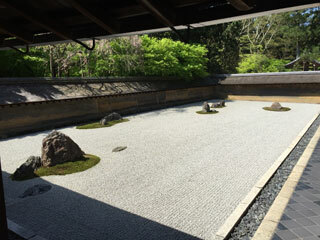 The Ryoan-ji garden is considered one of the finest surviving examples of kare-sansui ("dry landscape"), a refined type of Japanese Zen temple garden design generally featuring distinctive larger rock formations arranged amidst a sweep of smooth pebbles (small, carefully selected polished river rocks) raked into linear patterns that facilitate meditation. This article uses material from the Wikipedia article "Ryoan-ji", which is released under the Creative Commons Attribution-Share-Alike 3.0 License.